Just arrived in store are these fabulous one sized wool Newsboy caps . Made By Muckross Weavers in Kerry who have been manufacturing beautiful Irish scarves and hats amongst other things for the last 30 years. Made using 100% pure new wool and a one size fits all, they shape the face very well, are extremely comfortable and warm not to mention very stylish! We have them in a range of colours in store. 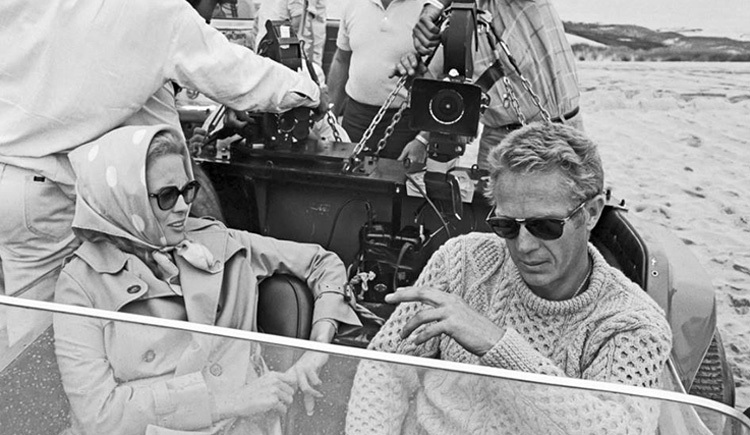 We love this image used recently in a piece on The Wild Atlantic Way website on the History of the Aran, showing Steve McQueen in an Aran. The Aran Sweater takes it’s name from the small cluster off islands off the west coast of Ireland at the mouth of the Galway Bay. 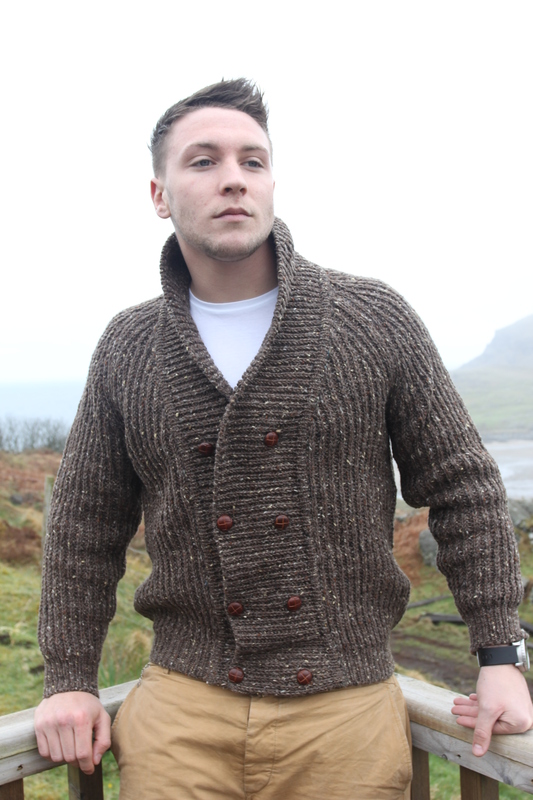 The islanders were mostly fishermen and farmers, with relentless weather and harsh winters, the heavy handknitted Arans evolved to cope with the these harsh conditions, keeping them warm and dry (originally some Aran sweaters would be made using oiled wool, where the natural oils were left in the wool, producing a waterproof effect). Alongside this, saw the evolution of the individual family stitches that would identify different clans or families. There were no knitting patterns in these times, everything was done from memory, but as individual family patterns evolved these were passed down from generation to generation and kept as closely guarded secrets. As time went on, and patterns began to become recorded and written, individual stitches evolved such as the : The Trinity or Blackberry stitch is said to represent the Holy Trinity, which is done by making 3 stitches from one and one to three across the panel hence it’s name. The Cable Stitch is a depiction of the fisherman’s ropes, and represents a wish for a fruitful day at sea. The Diamond Stitch reflects the small fields of the islands. These diamonds are sometimes filled with Irish moss stitch, depicting the seaweed that was used to fertilise the barren fields and produce a good harvest. Hence the diamond stitch is a wish for success and wealth. The Zig Zag Stitch, a half diamond, is often used in the Aran Sweaters, and popularly represents the twisting cliff paths on the islands. The Tree of Life is one of the original stitches, and is unique to the earliest examples of the Aran knitwear. It again reflects the importance of the clan, and is an expression of a desire for clan unity, with the continuation of life through the generations, with a wish of longevity for family members.The honeycomb represents the humble hardworking bee, fishermen believed if they saw a swarm of bees before going to sea that this was a great omen. While the Aran takes it’s name from the islanders, in reality they were made all over the country, particularly in coastal areas. This is still the case today, The Donegal Shop stock Aran sweaters that are made in Donegal, Mayo, Kildare, we even have some made in Dublin! Today there are a large range of aran sweaters. We like to put them into 3 categories. Machine made, handloomed and handknit Arans. The staple everyday aran is machine made, using 100% wool, generally combining the honeycomb, diamond and basket stitch, these can start at €49.99. Next are our handloomed arans, which are made in Donegal, made on a hand operated loom, which are of a heavier weight, have a chunkier feel and look like a handknit but without the price! They start at €89.99. Finally our handknits, made by traditional knitters in Donegal, in the old fashioned way where women are sent wool at home and knit up an aran in 3-4 weeks By a company called Magee. 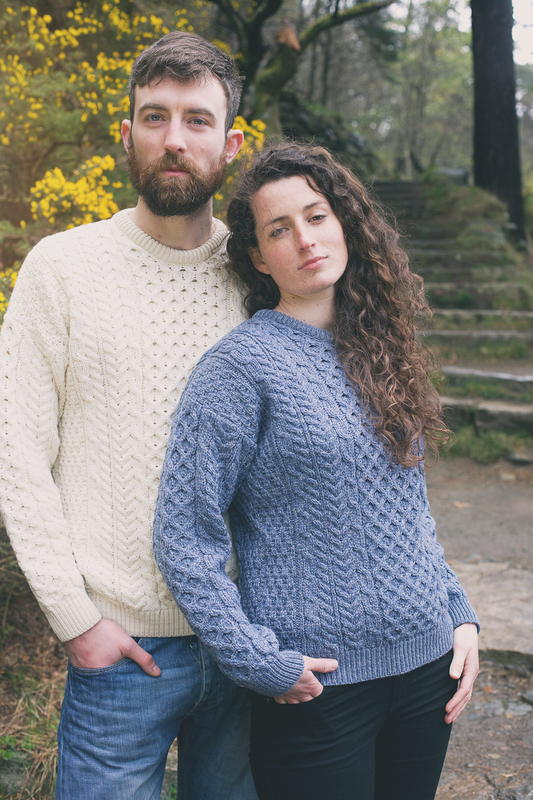 We are biased but believe these are the closest you can get to the traditional Handknit that started in the Aran island, Donegal shares a very similiar history of fishing, farming and harsh climates . Priced from €250, so the knitters are giving a fair wage (at 3-4 weeks work we wish it were more) and to cover the wool. 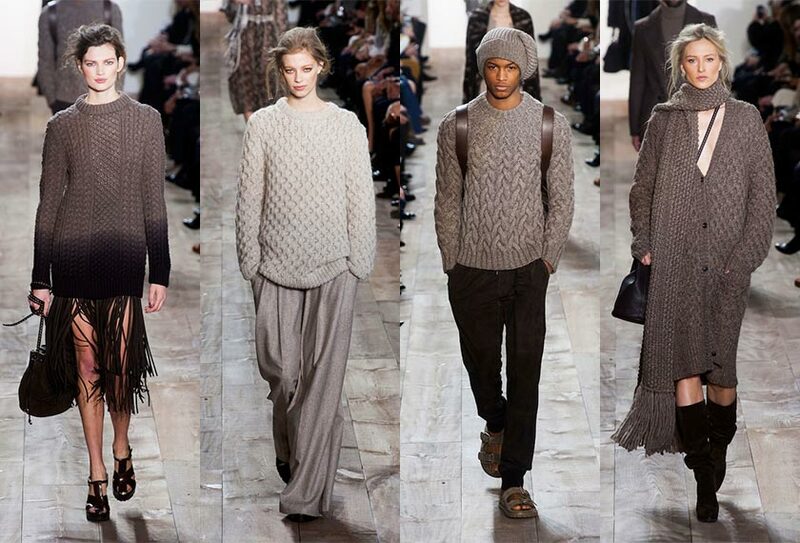 Handknit sweaters have a distinctive look and often have very unusal stitch combinations that make them very unique. We have been selling arans for close to 20 years, and they have been through a lot! They’ve been in fashion, out of fashion, provided heat and comfort when people are reaching out for their heritage having emigrated. They’ve been seen on ski slopes, in Vogue, The Farmers Journal, catwalks, popstars, farmers, fisherman, The Clancy Brothers and they are still going strong thankfully. They are a classic garment and hopefully always will be. We chosen some of our most popular gifts we sell online for gift ideas for this Valentines’s day. Sending cards and gifts to loved ones on this special day has long been an Irish tradition. In 1836 the remains of St. Valentine were given to the Whitefriar Street Carmelite Church in Dublin, as a gift from Pope Gregory XVI. A shrine dedicated to the saint still remains there today and has engrained a strong tradition of compassion and love on Valentines Day. It’s a still a chilly time of the year so what better way to show your love for that special lady in your life than a traditional Aran sweater! 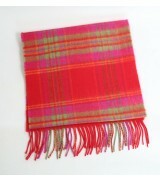 Another very popular gift idea is a woven wool scarf made with extra fine soft Merino wool and pretty in pink you can’t go wrong with one of these scarves. We all know someone who feels the cold and there is nothing worse than cold feet especially on Valentine’s day! 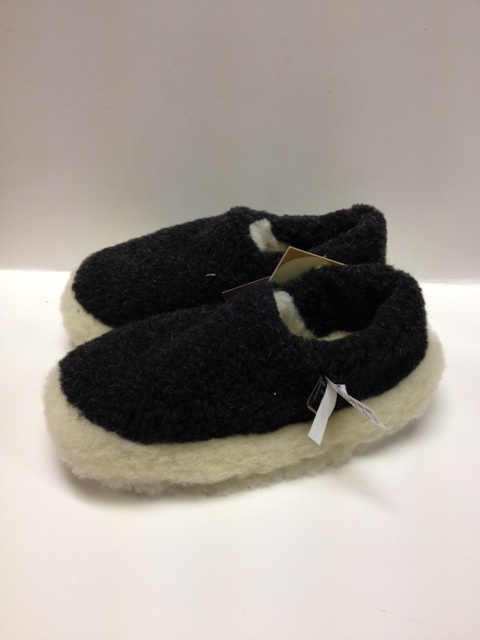 Wool slippers are great for cold feet and very cosy for this time of the year. All of these items are available on http://www.thedonegalshop.com and in store in our Dublin store. Wishing you all a very lovey weekend!